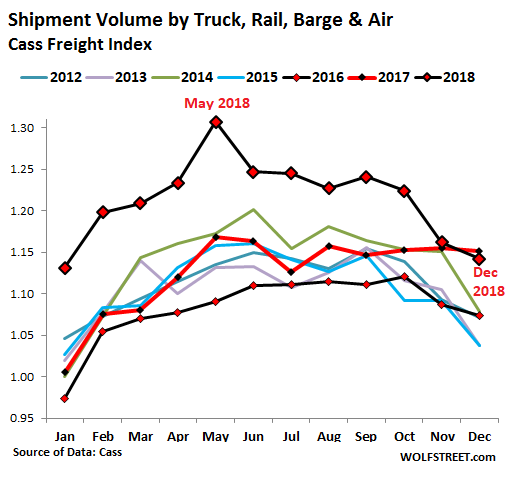 Freight shipment volume across all modes of transportation – truck, rail, air, and barge – in December declined about 1% from a year earlier, according to the Cass Freight Index, the first year-over-year decline since the transportation recession of 2015 and 2016, and the latest mark that the phenomenal mind-bending transportation boom with its double-digit surges has ended. The index covers shipments of merchandise for the consumer and industrial economy but does not include bulk commodities, such as grains or chemicals. A good barometer for the industrial sector is demand for flatbed trailers. They haul equipment and supplies for construction, manufacturing, oil-and-gas drilling, etc. 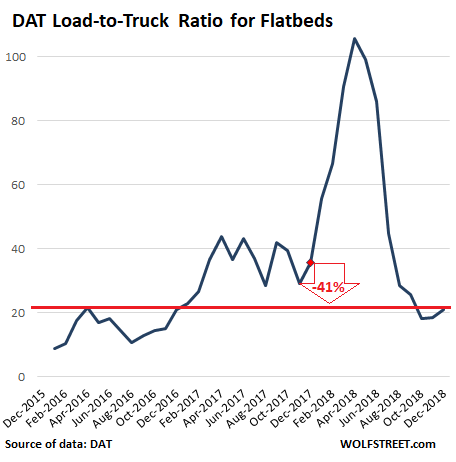 Demand for flatbed trailers surged in early 2018 as capacity suddenly tightened. This was in part due to the newly required use of Electronic Logging Devices (ELDs), and in part due to a sharp increase in demand. 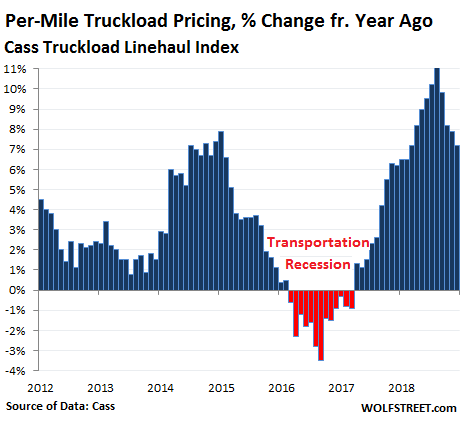 But declining volume – meaning slightly lower demand for transportation services – in addition to the planned capacity addition in trucking, as evidenced by the record number of Class 8 truck orders through last summer, makes me think that these surging prices will self-correct soon. 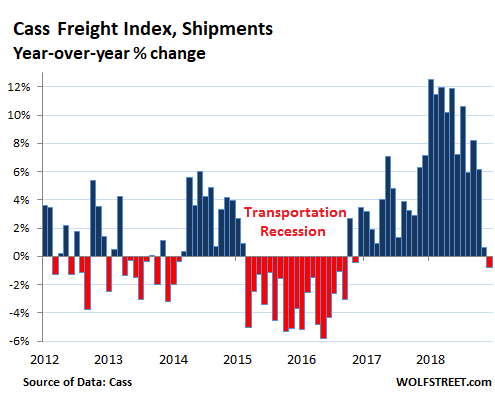 The transportation industry faces the consequences of large buildup of inventories that companies undertook perhaps to front-run a spate of tariffs, or that built up because sales of goods were just a little less than expected month after month. When these companies respond to the inventory situation by reducing their orders, they will also need less transportation services. This is one of the factors that makes this industry so cyclical. And this is why this industry is a useful barometer of the goods-based economy. Wolf, aside from employment data, are there any useful analogs for the service sectors as you have with transport industry for goods? Great question… many people have tried to find the answer. Where I veer into the goods-based economy is with retail, auto sales, auto manufacturing, imports/exports, truck manufacturing, oil & gas drilling, construction, etc. And transportation (a service!) happens to be a good measure of them because goods need to be transported. It’s not that simple with the service sector: housing (rents, sales), commercial real estate, finance, barbershops, healthcare, education, restaurants (food services), utilities, transportation and trucking (transportation services), etc….. This is the biggest part of the economy, and most of what I cover is services. 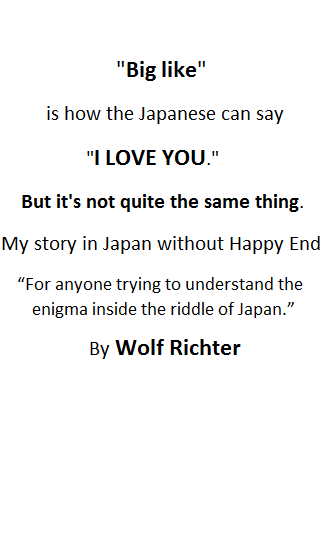 This is vast and complex. Parts of the services-based economy can do well while others might not. They’re not necessarily linked. So finding one indicator that says it all is tough. I was seriously someone had that answer (sigh). As a bit of reference, I’m a former field engineer who, when I went back to the university, ended up in economics (econometrics). Unhappily retired now, but it’s an interesting question still. Thanks! I do love this site. Very much of a detective mystery around here which I absolutely love. Wolf what is your take on Palladium? July last year Palladium was at 880 it’s now trading at 1390. Is there a shortage of this metal causing prices to jump? China car production mandate on catalytic converters increasing demand for palladium beyond supply. There is an imbalance. Don’t forget EU emissions changes may be driving some of this as well. Getting parts sourced, approved in-house bureaucracy, manufactured just-in-time by new/old source usually on new/modified production line, transit supply chains in place, etc. Customs, don’t ever forget customs! Line up international factor(s) for that. You get the idea. Back in the day I’d already have an approved budget/line of credit before I even went out and looked at what needed to be done in setting up a greenfield facility. That’s an seriously unlikely event for most engineers. Heck, not just engineers really. Likely just supply system issues. If it is being sourced from a nation being sanctioned it may be restricting the supply. The demand isn’t really going up since the car sales are dropping globally, so my hunch is supply related or artificial manipulation. Platinum is favored for diesel applications while modern formulations for gas engines demand palladium. The 2001 surged was driven by Ford seeking to horde palladium out of fear Russia, the main producer, would restrict sales. I built a position in the low $200 range after the last spike only to sell out at the $600-$700 level thinking it was near the top, oops. Diesel? Did you say diesel? 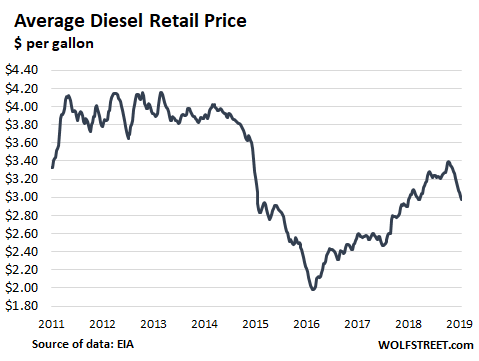 I think it’s time to check and see what’s happening to the demand for diesel engines in the automotive sector: it has totally collapsed. There’s plenty of palladium. It’s a price spike like so many price spikes. If you can ride it up and get out in time, kudos. But make sure you don’t ride it down, because it can be a long and painful ride. Last time palladium collapsed (1991), it went down around 90%, and it took 27 years for it to get back (Jan 2018). It has since shot past the 1991 peak. Palladium? I think it’s replaced Platinum in it’s use in catalytic converters as these prices have completely flipped for the last 3-4 years. What I don’t understand is why, now that Platinum is trading @ $800/oz. haven’t the automakers gone back to Platinum? Does it have something to do with EV/batteries? As those figures are based on year on year; that 1% fall is very little as last years figures increased so much on the year before. What would be better is a unit of quantity as opposed to a percentage increase on previous year. Or if a percentage, a percentage based on the figure 10 years ago. 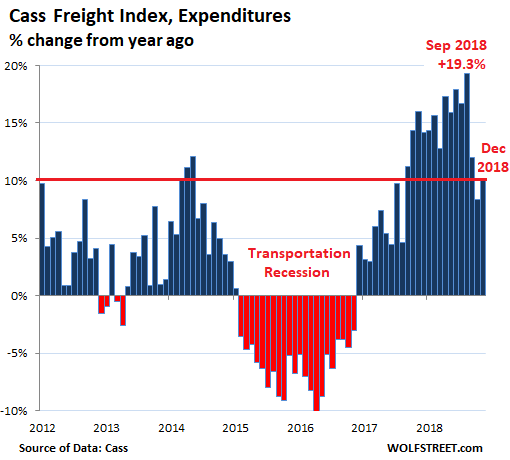 Is this going to be a self reinforcing recession? 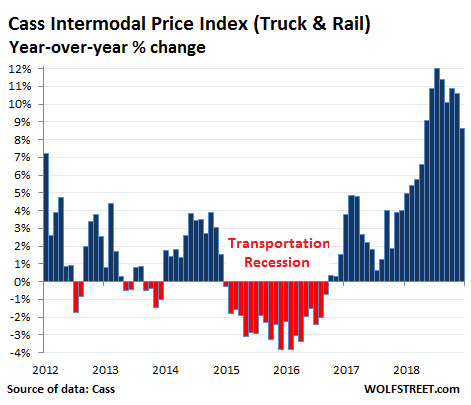 Trade wars&tariffs, brick and mortar meltdown, Canada’s lack of oil and gas pipeline capacity, online retail gaining ground, the geographically everchanging fracking business…it seems that the transport business is going to be just fine in the coming years. The automakers can’t just switch overnight from Palladium back to Platinum because of the high cost of retooling.